Freedom radio welcomes Mr. Ken Timmerman back to our Wednesday Jan 4th 10 AM Show. In 1995 Ken Timmerman with a group of Iranian patriots and with Peter Rodman and Joshua Muravchik, established the Foundation for Democracy in Iran(FDI) . Today, he is helping families of the victims of the September 11 attacks prepare a class action law suit against the government of the Islamic Republic of Iran, because of its direct, material involvement in the al Qaeda plot to attack America, a story he detailed in Countdown to Crisis and in several news stories that can be found here. We will discuss this case along with other current events related to Iran with Mr. Timmerman on Freedom Radio. Best-selling author Kenneth R. Timmerman has spent his career investigating the dark side of national security. His work can be found at Front Page Magazine and at the Daily Caller. His latest book “St. 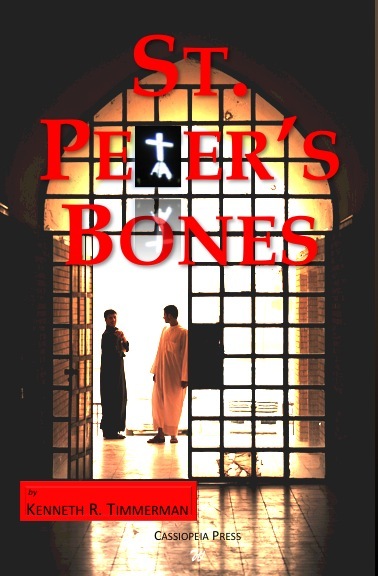 Peter’s Bones” can be found here. Over the past three decades he has interviewed dissidents behind the Iron Curtain, covered numerous Middle East wars and false-hope peace treaties, interviewed suicide bombers, debriefed defectors from Iranian intelligence organizatons, and covered the plight of Christians persecuted for their faith. Lieutenant Colonel Bill Russell also joins us to discuss his op-ed in response to the Tribune-Democrat’s Chip Minemyer’s ‘Murtha was right’ commentary and the last ‘Haditha’ Marine trial of SSgt Frank Wuterich that will begin Thursday, January 5. LTC Russell retired after 29 years in the Army (active and reserves), served in Iraq and the Balkins, and was inside the Pentagon on 9/11. Russell ran against the late John Murtha for U.S. Congress in PA-12. Co-hosting the show will be Tim Sumner, co-founder of 911 Families for a Safe and Strong America and The Liberty Alliance. Wednesday December 14 at 10AM EST we are pleased to have with us Mr. Dan Riehl of Riehl World View as we discuss the latest news especially Glenn Becks recent hair raising remarks about Newt Gingrich supporters. Dan Riehl began his writing career while studying journalism in college and went on to edit his college newspaper prior to graduation. After a short time as a freelance writer and employee of a mid-sized weekly newspaper, he went on to apply his writing skills as a marketing and sales manager for a Fortune 100 corporation. Today he maintains a popular Internet blog, RiehlWorldView His work can be found also at Big Government and also at Pajamas Media. Tim Sumner of the Liberty Alliance will also join us with Freedom Radio’s incomparable weekly National Security Update. Call in to 646 478 5613. Freedom Radio will be pleased to welcome to our show at long last, Bob McCarty the author of the Amazon Best Seller Three Days in August: A US Army Special Forces Soldier’s Fight for Military Justice . Learn more about Mr. McCarty and his work by going to his website Bob McCarty Writes. McCarty’s work also appears frequently at Andrew Breitbart’s BigGovernment.com, BigHollywood.com, BigJournalism.com, BigPeace.com as well as PAJAMAS MEDIA. His blogging efforts have also received mention on both Rush Limbaugh, Fox News and others. Freedom Radio is committed to the release of our solders being wrongly held in Levanworth. The heartbreak attached to the stories of those soldiers including Lt. Michael Behenna who are wrongly suffering at the hands of the country they vowed to serve, is always fresh and painful and never too far below the surface. These stories never fail to send me over the edge of composure. Thus I confess to hesitating to read the story of Sgt First Class Kelly Anthony Stewart, a man who had a consensual one night stand with a German woman, and was convicted of multiple sexual assault charges on essentially no evidence, no witnesses, only the word of the accuser. You always hope that someone has got your back. Join us on Freedom Radio, and call in to 646 478 5613, and let Sgt Stewart and his family know, that we have his back. Freedom Radio is also honored to have with us, Joel Arends, Captain, USAR, holder of the bronze star and currently the Executive Director of Veterans for a Strong America. Joel Arends is an attorney and a veteran of Operations Iraqi Freedom and Enduring Freedom. In 2003-2005 Joel served as an infantry Platoon Leader in the Army’s 1st Cavalry Division in Baghdad and provided security for Iraqis as they went to the polls for the first free and fair elections held in the last fifty years. Joel formerly served as the Executive Director of Vets for Freedom. While there (at VFF), he helped to build the nation’s largest Iraq and Afghanistan veteran’s organization. Over the course of two years Joel and his team successfully established chapters in all 50 states while enlisting the support of over 110,000 members. As noted above, Arends is now a Captain in the Army Reserve and Executive Director of Veterans for A Strong America. Freedom Radio, every Wednesdays at 10 AM EST. Chris Gaubatz went undercover as an intern for the Council on American-Islamic Relations at CAIR’s national office in Washington, D.C. He played his part so well, he found himself working alongside leaders Nihad Awad, Ibrahim Hooper and Corey Saylor. Gaubatz’s father, and investigative project leader P. David Gaubatz used the fruits of his son’s undercover operation to co-author with Paul Sperry the definitive product of the perfect sting operation, Muslim Mafia. Gaubatz’s six-month covert operation on the Washington-based Council on American-Islamic Relations resulted in a collection of thousands of pages of confidential documents from this rendering of the terrorist group Muslim Brotherhood, which continues to represent itself as a civil rights group. Muslim Mafia pulls no punches as it presents the fruits of this landmark investigation. The documents presented disclose the motis operandi of the Muslim Brotherhood in its disguise as CAIR as it works to support international jihad against the United States. CAIR/Muslem Brotherhood of course was not happy with the work product of the investigative team of Muslim Mafia. Their reaction to exercise lawfare is standard course for supporters of Jihad, who seek to destroy their targets financially. The Gaubatzes were then required to obtain legal representation and could have done no better than to have recruited Daniel Horowitz. Listen to Freedom Radio’s interview with the world renown first amendment rights and criminal attorney Daniel Horowitz here. The classic tactic of waging lawfare against those who would exercise their creator-endowed first amendment rights while daring to expose the terrorist nature of the Muslim Brotherhood’s PR branch in the United States, The Council on American-Islamic Relations has fallen into a predictable template. Just the day before the Freedom Radio interview with David Horowitz, Steven Emerson of the Investigative Project on Terrorism was hard at work exposing the latest attacks of CAIR on an individual who would also dare to pull the mask off the face of the organization. …(the) Minnesota chapter attacked them (Bihi and Jamal) over their involvement with a seminar on Somali culture and their communities in America held Thursday in St. Paul…. ….One subject in particular incurred CAIR’s wrath. It was entitled “Al Shabaab: An Islmaic Estremist Terrorirism Organization”. Al-Shabaab is an al-Quida affiliate……. ….CAIR’s comments about Bihi and Jamal amount to “character assassination” said Tom Lyden, a reporter for Fox 9 News in Minneapolis. The two are targets because they ‘were the first to blow the whistle on the effort to recruit Minnesotan Somalis for terrorism in Somalia,’ …. Read Steve Emerson’s complete article here. Listen to Freedom Radio’s interview with Abdirizak Bihi here. Further, CAIR seems to have insinuated itself and its tactics with members of the US House of Representatives. One need only watch Rep. Pete Kings (R, NY) hearings on terrorism and take note of how a certain few representatives work to discredit the testimony of the Non-CAIR or Non-Muslim Brotherhood affiliated witness, taking up the tactic of those who seek to oppress free speech. Those representatives seek to demean Dr. Zhudi Jasser, President of the American Islamic Forum for Democracy and Abdirizak Bihi of Somali Education and Social Advocacy Center and Melvin Bledsoe, the father of a young college student who became radicalized and killed an American soldier at a recruiting station in Arkansas. Watch their testimony at the Peter King hearings in March here. With only the evidence presented above, a pattern of behavior on the part of CAIR to destroy the credibility of those who would expose them, and to further destroy them financially by forcing response to frivolous law suits, is easily recognized. Learn more about Dr. Zhudi Jasser here. Learn more about Abdirizak Bihi, here. Learn more about the Liberty Alliance here. Follow the great Steve Emerson’s work here. Freedom Radio welcomes back Beth Gilinsky, Wednesday October 26, 2011 at 10 AM EST. Ms. Gilinsky is the President and founder of the Jewish Action Alliance. She is also a co founder of the Liberty Alliance as well as a recipient of the Center for Security Policy’s Freedom Flame Award for her work to stop the closure of Gitmo and domestically held trials of Gitmo detainees. Beth has also dedicated her time and energy to the effort to stop the Ground Zero Mosque from becoming a reality. We are also proud to welcome back to Freedom Radio Lt. Col. Wm. Russell former candidate for the House from Pennsylvania. He and his family risked everything to unseat the despicable Jack Murtha from his throne in his Rob Gleason (Republican State Chair) fiefdom. He joins us to discuss the ongoing case of Staff Sgt Frank Wuterich and the slander on the so called “Haditha Marines”. Freedom Radio welcomes Ken Timmerman, President & CEO of the Foundation for Democracy in Iran. His work can also be found at the Daily Caller. We are also proud to welcome back to Freedom Radio, Dr. Zuhdi Jasser, founder of the American Islamic Forum for Democracy The AIFD mission is to advocate for the preservation of the founding principles of the United States Constitution, liberty and freedom, through the separation of mosque and state. We shall discuss Mr. Timmerman’s recent work related to the attempted assasination of the Saudi ambassador by the Iranian government as all as the White Houses refusal to utilize Dr. Zuhdi Jasser a respected and strong opponent of radical Islam.